This circuit is modeled very, very, loosely after the tone of Robben Ford and his Dumble. 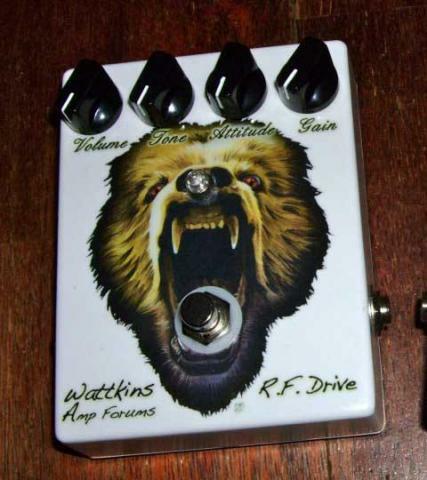 It's not another "clone" pedal and doesn't make any claim to be one. 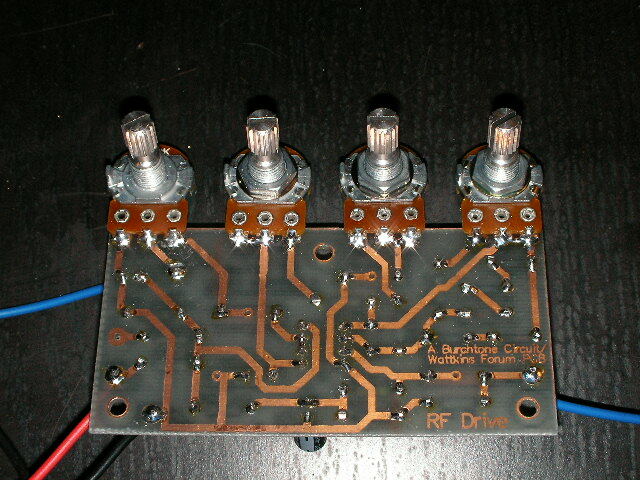 Special thanks to Burchtone for the original schematic and Katopan for the PCB layout. 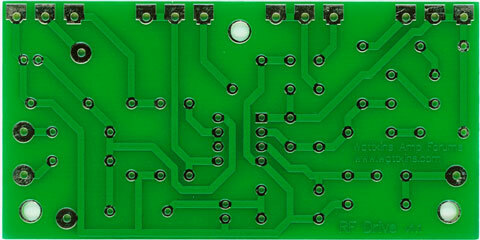 We just had a second batch of PCBs (another 200) made up and they are now available for sale. Please note these pictures are not to scale. The actual PCB is slightly smaller. Resistors - 1/4 to 1/2 watt, metal or carbon film (your choice). 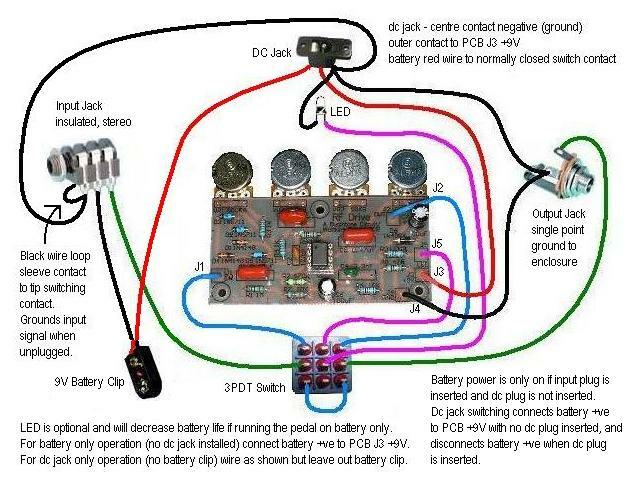 Caps - You don't need High Voltage rated caps as this is only a 9V pedal circuit. But feel free to experiment with different types. You'll notice there are 0.2" and 0.4" spaced pads for the 4 signal caps which allow for different physical sizes. A lot of folks have tried Sozo's, and like their sound, but they are a bit on the humungous size for this project. Also recommended are the Russian green paper-in-oil caps but, again, these are on the big size as well. A lot of people are happy with the smaller and more inexpensive (but high quality) Panasonic "greenie" caps too. 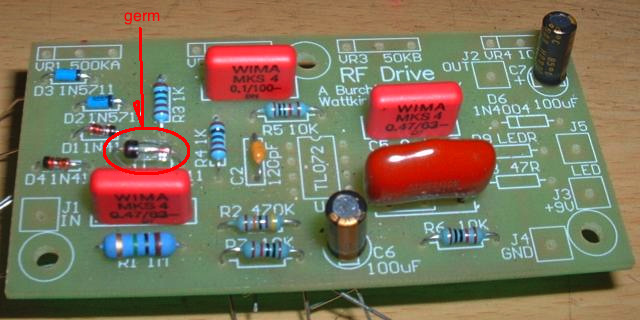 Electrolytics - Once again it's only a 9V circuit. 16V or above will be fine. Just be sure to get a size that has 0.1" lead spacing so it goes into the PCB easy. Pots - 16mm pots with 1/4" shaft if you want to PCB mount them, or any type if you wire to them off-board. Switch - Normal stomp box style footswitch. 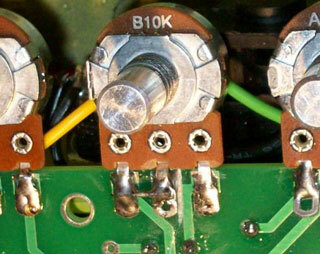 3PDT if you want to switch an LED as well as true bypass, DPDT if you don't want an LED. There's a wiring diagram in the thread. Enclosure - Totally up to you, depends what you can get and what look you want. Diecast aluminium box, instrument enclosure, diy folded sheet aluminium, purlin, etc. Jacks - Use whatever you like as long as the input jack is stereo. That way the ring is used to connect the battery when you plug an instrument cord in. One recommendation is to use an insulated jack (i.e. Cliff) for the input and a non-insulating one (i.e. 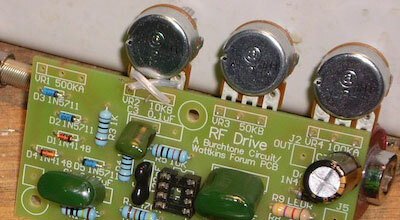 Switchcraft) for the output jack, which becomes the single earth reference connection to the enclosure and the star ground point. But both jacks can be the same. LED - Your choice.... Pink with purple polkadots if you can find one. Pot spacing on the PCB is 0.9” giving 2.7” or 68.58mm between the first and last pot spindle center. The hole size normally specified for 16mm pots is 7.5mm but an 8.0mm or 5/16” drill will allow adequate clearance and still support the mounting washer and nut. These files are sized for 600 dpi printing. If you print with no scaling they will be spaced to match the PCB. This should be checked before drilling or adhering graphic against the measurements above. This picture is of a prototype PCB, not the finished PCB. 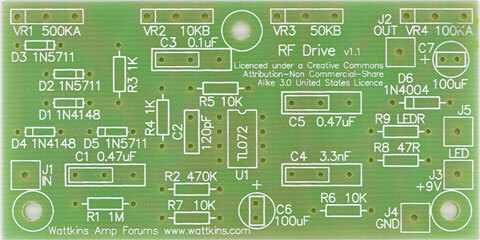 wattkins.com RF Drive PCB by Wattkins Amp Forums is licensed under a Creative Commons Attribution-Noncommercial-Share Alike 3.0 United States License. Based on a work at www.wattkins.com.